Mawda was killed when Belgian police opened fire on a van carrying 30 refugees, including two families with four children under 6, during a chase of the van, the driver refused to stop. A bullet hit Mawda Shawri on the face, she was pronounced dead at her arrival in hospital. The family were not allowed in the ambulance and were arrested: they only heard of the death of their little girl two days later, after being held in a police cell. The incident took place the night between 16th and 17th May 2018. 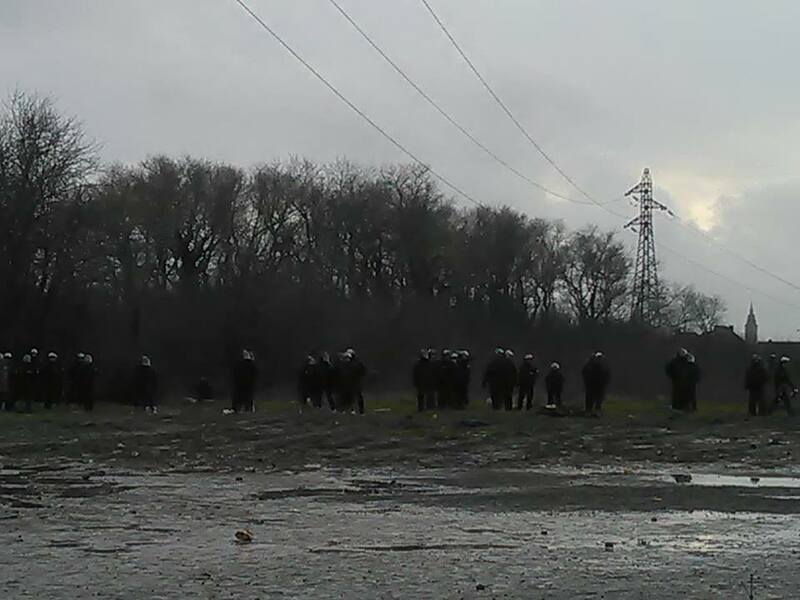 The Kurdish community at Grande-Synthe near Dunkirk, where Mawda had been staying, held a spontaneous protest on the 17th and bloked the motorway before being dispersed by riot police. A vigil was held in Calais, as always the day after somebody dies at the border. 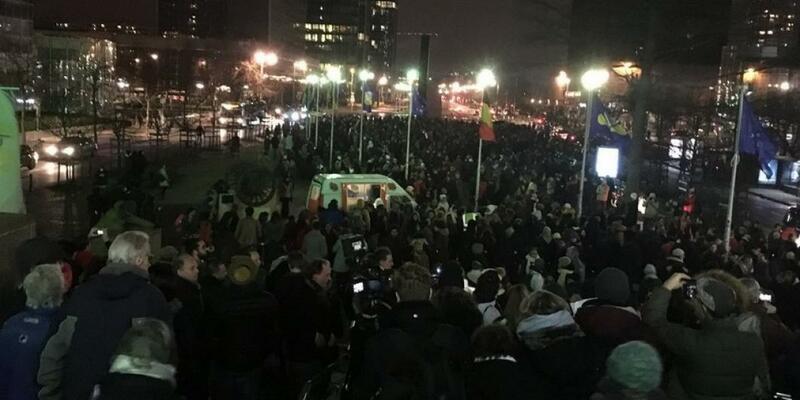 Protests followed in several Belgian cities, and calls for the resignation of the Interior minister Jan Jambon. What can you do? 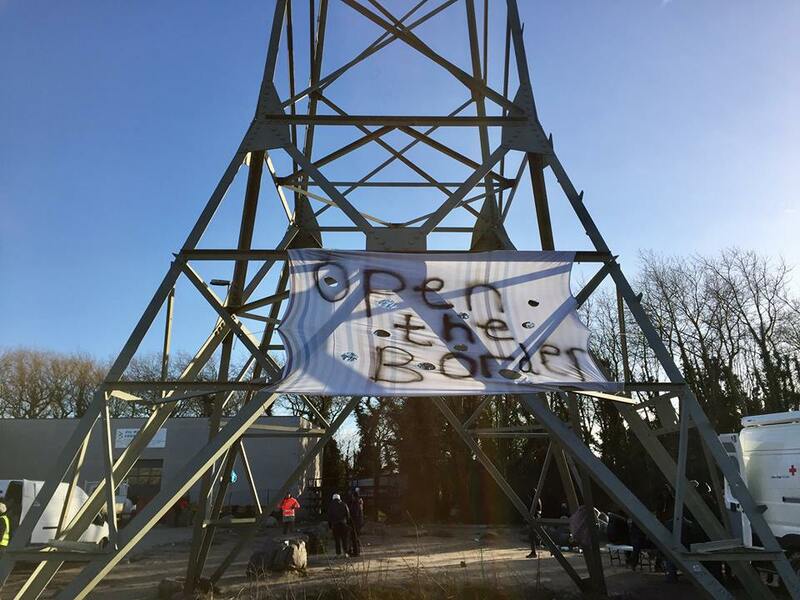 Use this letter template asking your MP to call the government to action: goo.gl/cNs8AV What happens at the UK border is the result of UK policies to stop migrants on the other side of the channel. On the 24th May, planned evictions of all Dunkirk sites went ahead. 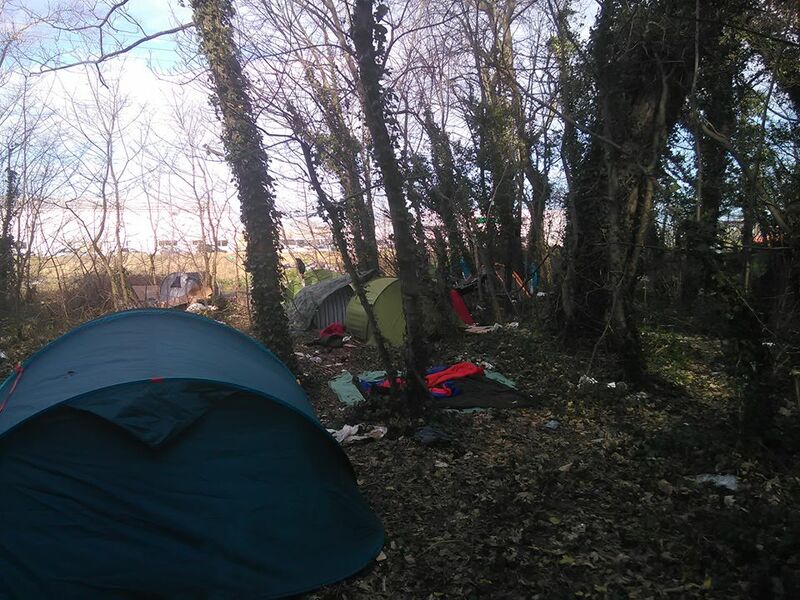 The migrants in Dunkirk are now living in the woods, 80 people at least, more will come back from the temporary accommodation centres where they have been driven because they need to go to UK. 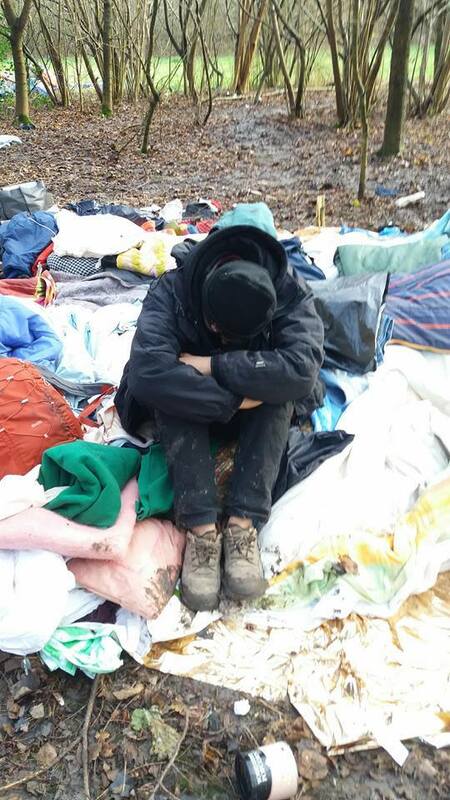 There are no camps because they have just been destroyed, people are just sleeping rough, and no water because the mayor, Damine Careme, had it cut off when he opened the shelter, to discourage people from living in the woods. 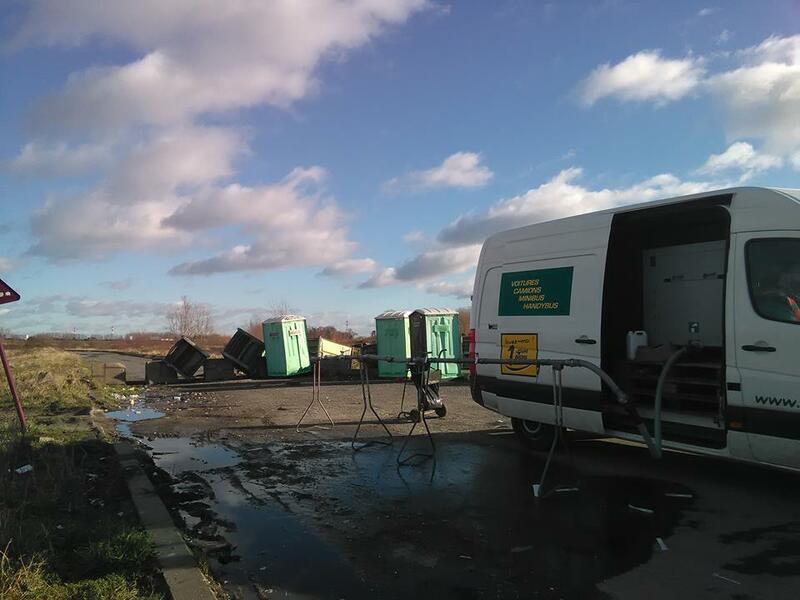 The area where people are settling is full of toxic fumes and noise from factories. In Calais, segregation in the ‘jungles’ is complete. Migrants do not go to town any more because they are afraid of being arrested. Destruction of tents, blankets and people’s property by police are a daily occurrence. There is no water. Police violence is very high and there is a proliferation of guns in the camps, especially in the Afghan area, and guys with guns and cocaine addictions, and underage boys sleeping there. After the shooting in February, when 5 very young Eritreans nearly got killed, police did not catch anybody. Volunteers keep going to the jungles to bring humanitarian aid, else there would not be any witnesses. They continue to be heavily harassed by police, and sometimes thretened by smuglers and crazy guys. Their courage and perseverance are truly inspiring, and so is the courage of the people in the jungles, who keep smiling despite the situation. However they are not really happy. Many people have gone to England, the others have high hopes. There are quite a few women besides minors and very young people . Numbers have gone down. Tubrerculosis spreading. 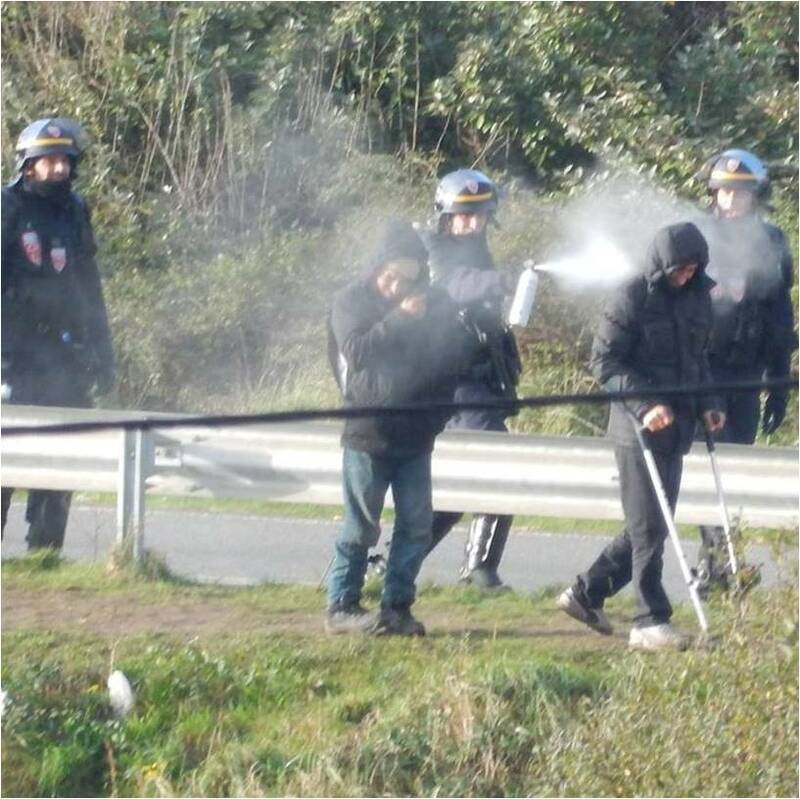 I find it intolerable that people are pushed in such conditions, and I blame not only the French State, that is behaving like a fascist State, but also the heads of the main associations, who collaborated with the eviction of the jungle in 2016, even signing a letter of approval, and this is the result. Now Jean Claude Lenoir, president of the association SALAM, has stopped going to meeting at the prefecture, better late than never, in protest at the appalling situation. Christian Salomè president of the Auberge des migrants keeps going to these meetings. To call them meeting is an improper definition, the authorities just tell the associations what they are going to do, they do not listen to what the associtaions say, they just rely on the associations to tell the migrants what they are gong to do. Vincent De Conink, responsable of the Calais mission of Secours Catholique (Caritas) has left, he was the most outspoken and willing to face the authorities. The new daycentre of Secours Catholique is very good, and since the charities have vans to drive people to and from the jungle quite a few people have started going there. The Red Cross have an outpost in rue Verrotieres where the food distribution was, I will write elsewhere what I think of the Red Cross but the volunteers are nice, and it creates a bit of a social space in the wilderness. The Red Cross have a tracing service for missing migrants, many use it to find friends and family members. The new food distribution is two streets from Verrotieres, and the food is not bad, filling and with a lot of meat. Some barb wire has been cut off, some holes made in the fences and a back entrance has been made, entire parts of fence have been removed so it does not look so much like concentration camp now, and the police wathces from a distance; at the beginnng people did not want to go there and boycotted the new State food distribution run by la Vie Active , a big boycott action. The Refugee Community Kitchen keep cooking, and volunteers from various associatins keep driving around vans full of food, that they distribute near all the jungles and also in Dunkirk, and there is also a distribution in Calais centre for the few lucky ones who have papers, so the food situation is better than before, only the water is missing. Another thing that is missing is political action, apart from the solidarity march initiated by the Auberge des migrants, that may be a nice initiative but I cannot really trust the Auberge to lead the resistance, sometimes they defend the migrants, sometimes they side with the institutions. Radical action is disappearing. 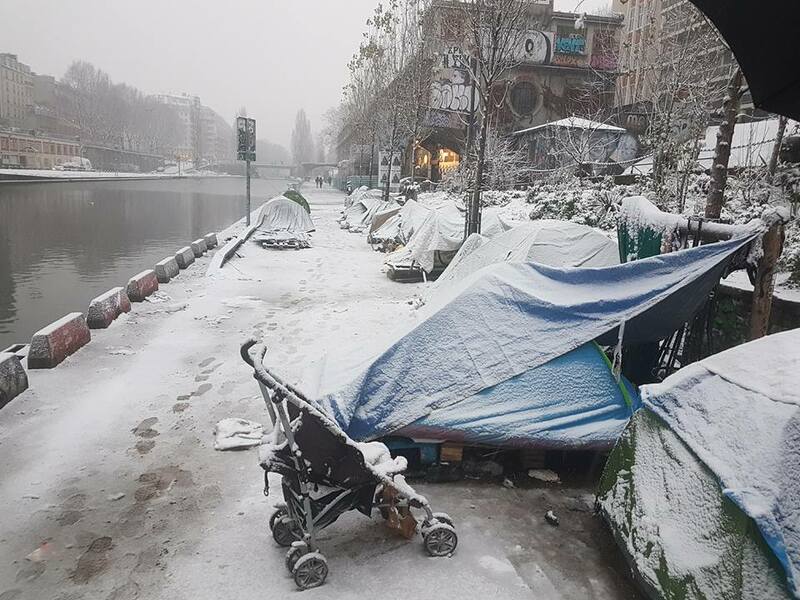 Up to 2.500 men, women and children are surviving in the streets of Paris in appalling conditions. Two men have drown falling in the river. The Interior minister Collomb, sollecitated by the mayor of Paris Annie Hidalgo, promised to destroy the camps and re-house the people – which may help those who want to stay in France, but in the case of the numerous people with fingerprints in other countrie could result in more deportations. Afterwards, as usually happens, the tents and belongings left behind were destroyed. What will happen to the people? The lucky ones will end up in nice accommodation places, that is the minority. The vast majority will end up in sub-standard accommodation, dormitories, temporary accommodation places where they can stay up to three days. The most unlucky ones will be placed in detention centres and deported to other ‘safe’ third countries under Dublin regulations. Or worst, will be deported to Kabul, or to Khartom. Eventually many (the majority) will return to the streets, in the absence of any dignified and permanent solutions, the camps will start building up again, new people will arrive. As usually happens. Since the accommodation system in France is a shame, and nobody is willing to fix it. (I love it when the guy from France terre d’asile says in the video it is normal procedure, 30th time he saw it in a few years, no trouble everything quiet etc. FTdA is a collaborator with the State, needless to say). Meanwhile in Dunkirk many people are returning and setting up camp in the woods. As Mobile Refugee Support write: “One week on from the full eviction, many people are already returning to Dunkirk. Today has again seen the arrival of new families and groups. The new “camp” is far from ideal and is situated in a hidden area of woodland behind an industrial plant”. On the 30th May THEY WERE EVICTED AGAIN and again put on coaches to unknown destination. The photo was taken a few hours before this last eviction by Mobile Refugee Support team. A national demonstration is planned in Paris for the 2nd June against the new immigration law, that if passed will see asylum rights very much curtailed. Questo articolo è stato pubblicato in Senza categoria il 27 maggio 2018 da EXODUS - watchtheborders. New wave of intense cold in the North of France, please donate. Volunteers are literally saving lives. Due to constant destructions by police of people’s tents, bedding and belongings everything is always in short supply. I think the biggest emergencies are Paris and Dunkirk. In Calais there is constant need too but there is a bit more support, and shelters for the extreme cold are opening though places are not sufficient and there are always many people sleeping out. 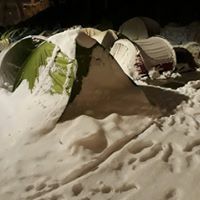 Mind the authorities and police always destroy tents when people are in the cold weather shelters, so please send and save tents for when the shelters close. After the last big destruction near rue Verrotieres, people spent two nights out without shelter because the Auberge des migrants did not have enough (400) tents to give. As you can see the very numerous evictions and constant police harassment have failed to stop new camps forming again. The CAO system is always saturated and it does not meet the needs of those who do not want to apply for asylum in France, that is the only ‘solution’ on offer at the end; all emergency accommodation is always saturated. Paris Refugee Ground Support report of 65 people arriving in the Paris North camps over the last week-end in just 48 hours, including many underage boys and girls. Women and families with young children are usually sheltered by volunteers and local people but they do not manage to shelter all the unaccompanied minors. By law these kids should be given a roof and some protection, but they are often turned out from the official shelters for minors for lack of spaces, or for spurious reasons such as they cannot proof their age. Hundreds of underage boys are sleeping in the streets of Paris. In the cold and snow, exposed to violence and sexual exploitation. 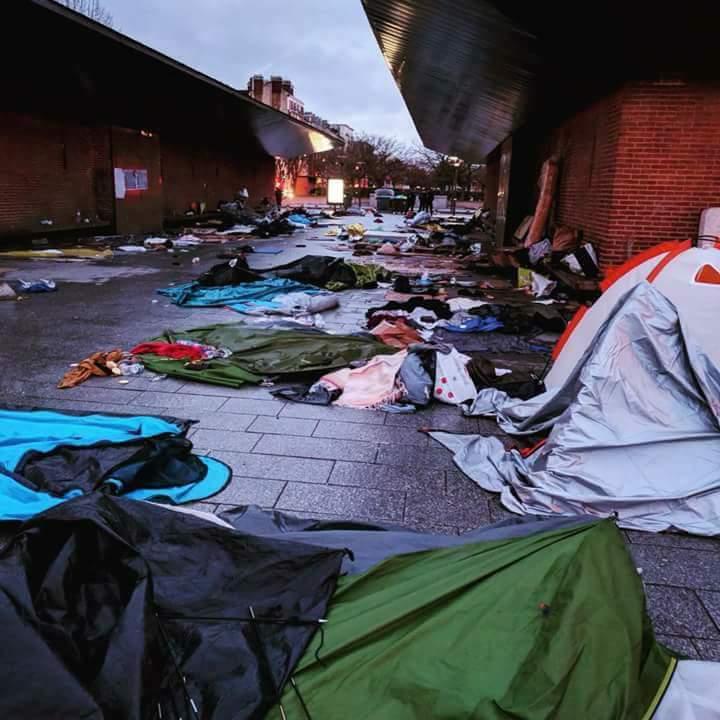 Many of the people who sleep out in Paris are Dublin cases, including many young people who applied for asylum in other countries especially Norway and Denmark and were rejected when they turned 18. Many are from Afghanistan and are at risk to be deported back there if they are returned to the first ‘safe’ country. Often they are deported directly from hotels and temporary accommodation, but nobody warns them. Other main nationalities are Eritrea, Ethiopia, Sudan, Iraq, some from Pakistan and some from other African countries. People who sleep out in central Paris have a very hard time, with police constantly harassing them, spraying them with CS gas and forcing them to move, minors included. 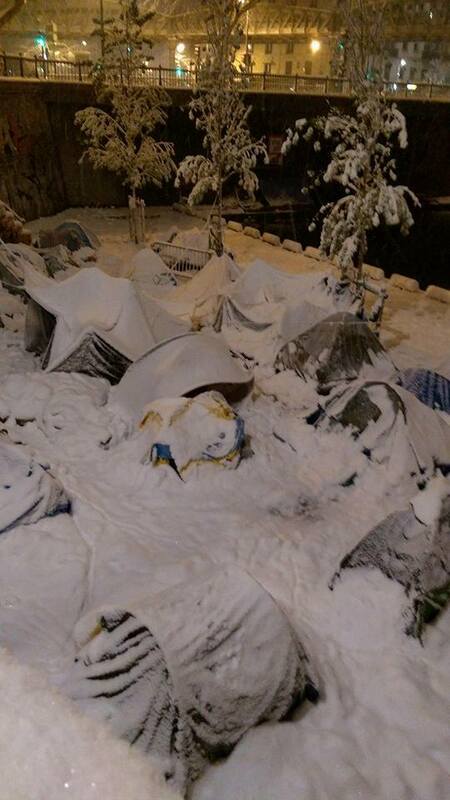 The ‘Bulle’, the ‘humanitarian’ camp opened by the mayor of Paris Annie Hidalgo last year where around 400 single adult males are warehoused in very squalid conditions is always full, and it functions as a centre to identify people – but nobody tells them they can be dublined when they enter, usually after queueing all night in the cold. The centre is managed by Emmaus Solidarite’, Utopia 56 who were helping with the Bulle withdrew in protest. for Paris Refugee Ground Support. Umpteenth destruction of Puythouck camp: tents, bedding, a kitchen and people’s possessions destroyed under their eyes. This winter the mayor of Grande-Synthe Damien Careme succeeded into opening a shelter in a disused sport centre, against the will of the government, where some 300 people sleep in very squalid and overcrowded conditions including families, who have separate quarters from single males. At the same time the shelter was opened, Damien Careme had the water cut at Puythouck in order to dissuade people from camping there. However people keep going to the jungle because they don’t find place in the shelter; some have been kicked out, including a 15 years old boy who got involved in an argument and is now sleeping out. There are often tensions as Kurds and Afghans are mixed in the shelter. Some people refuse to be dispersed to temporary accommodation places far from Dunkirk. Recently we were looking for accommodation for a family with a very young daughter, they did not find place in the shelter and refused to move to far away accommodation because they were going to try to pass. They ended up sleeping out, volunteers gave them a tent. Some people put their tents up next to the sports centre, others go to the jungle at Puythouck. There are always dozens of people sleeping out including people who have just arrived. People are pressurized to move to CAO, where they are pressurized to apply for asylum in France. In Grande-Synthe people have less support than in Calais because there are fewer volunteers. Apart from food (provided by RKC and other associations) everything else is in short supply: tents, sleeping bags, water, wood for burning. 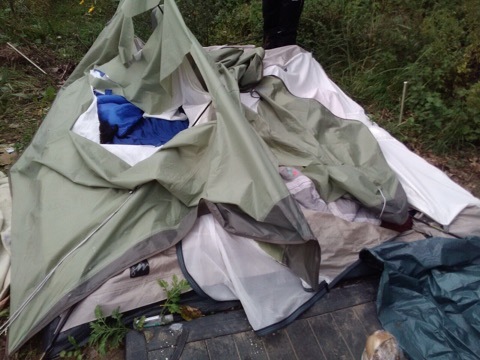 In Calais the war on tents and blankets continues unabated, and also here it has not succeeded in preventing the formation of new camps: there were well over 1000 people sleeping out before the last big fights. If it is a war, the people are resisting, even winning: they keep returning to their camps after each destruction, and they are still going to England. I do not know why the associations keep saying there are 800 migrants in Calais, it is a gross underestimate. Over 1000 were eating at the food distributions, and many do not eat there. Hundreds are underage boys. Many left Calais after the big fights, making the numbers given by the Auberge come true. Many went to Paris, just in time to catch the snow. No doubt they will return, if they have not returned already. I am trying to organize support in Calais on the basis of SOLIDARITY NOT CHARITY, horizontal and migrant-led; if people are interested to help organize independent distributions I would like to know, for future reference. I am NOT suggesting independent people just turn up and distribute, as usual local knowledge is essential, and some communication and organization. There is an urgent appeal for accommodation in citizen’s homes, especially during the cold that is coming, and especially for minors. Questo articolo è stato pubblicato in Senza categoria il 23 febbraio 2018 da EXODUS - watchtheborders. Children of Calais. Calais own mass shooting, and other terrifying incidents. It was an Afghan, smuggler presumably, who opened fire on a crowd of about 30 young Eritreans, wounding 5, 4 in life-threatening conditions, 1 serious. The police are looking for a 37 years old Afghan man, as the shooter has been identified. The victims are all between 16 and 20. It started as an argument between Eritreans and Afghans at a lunchtime food distribution near the hospital . It developed into one of the most terrifying fights in Calais ever, involving pretty much everybody, even those who did not want to fight. Africans got very angry hearing there were Africans in hospital with serious bullet injuries; according to a ‘jungle rumour’ there were 7 dead! Africans started to attack everybody who looks Afghan, or is light skinned, Libyan, Egyptians, Iranians and others were all being attacked. The first fight was at a food distribution near the hospital, the second at the food distribution in rue Verrotieres, the third by night when the Eritreans attacked the Afghans sleeping near the hospital, near where the shooting had happened. Hundreds of people got injured, including many underage boys.The number 22 diffused by the press is the number of people hospitalized, not that of people injured, that is much higher. Many were medicated and dismissed, even people who had leg injuries and could barely walk, never mind run, released to the most dangerous streets with a bit of paracetamol. Many did not even bother going to the hospital. There are hundreds of minors as young as 13 living in such danger in the ‘jungle’. We managed, with great difficulty, to find accommodation for 13 people, including a 13 and a 14 years old Afghan boys who had just arrived, other minors, an injured man, a middle aged man who had to go for an operation. When I was managing an office space in Calais we had 12 Afghan minors 16 or younger sleeping there every night (more when it was colder). I so much miss… being able to provide some protection to people. Unfortunately the citizen’s network in Calais has shrunk, there were 15 citizen’s households offering accommodation to refugees, now are fewer. Opening squats is not an option: as long as the state of emergency lasts, and they made it permanent, the authorities can close any squat, legal or not legal, at any moment, if there is a’security risk’, there will be always until the local authorities change. 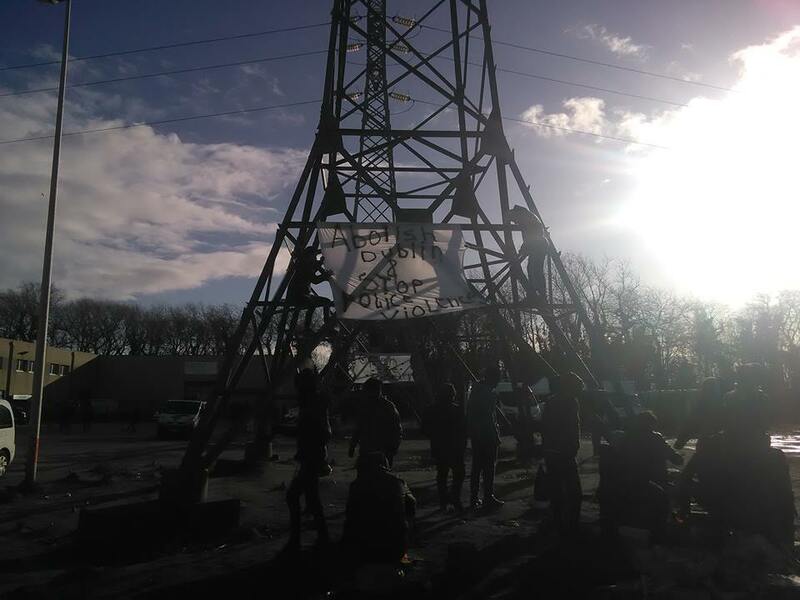 Two legal squat in Calais centre were opened, and evicted immediately. I don’t know, to me seems like a waste of time. Maybe elsewhere, but in Calais? If police don’t shoot them, the mafia will. Only recently a 16 years old Eritrean man lost an eye when a gas grenade was fired in his face, had multiple cranial fractures, his nose was pushed inside his skull and he nearly lost the other eye. The policeman who shot him is being investigated. When the Dubs amendment was passed the intention for the House of Lords was for 3000 unaccompanied asylum seeking children to be relocated into the UK. When it was passed law they did not specify number. The Home Office pledged to relocate 480 children under the scheme however, as of 23 January, 2018, only 230 children having relocated from Europe to the UK under the provision. Now the Dubs scheme has re-opened, but the cap is at 260, a ridiculously low number; after, they will close the scheme again. I saw many people injured, three minors hit on the head, one was saved by two of his African friends who intervened to protect him, still had a ugly gash from some other Africans hitting him. It seems to me the media make up things as they go, the Guardian for instance also blamed the incident on the increase in people after Macron’s visit, 200 people more according to the newspaper. There were well over 200 people arriving after Macron’s visit, the kitchen started making 2700 meals per day, especially minors hoping to go to England, they were disappointed and many left again; a rise in numbers can add to the tensions, but tensions between Afghans and Eritreans have been going for many months and since the Grande-Synthe camp burned down, many Afghans moved to Calais and began displacing the Eritreans near the Secours Catholique day centre, then near the hospital. The ‘humanitarian’ camp at Grande-Synthe burned down after a massive fight between Afghan and Kurdish smugglers involving knives and guns. The recent increase in numbers of people coming to Calais was not the cause of the shooting and fights, access to parking areas and to the motorway are the cause, and control of territory. Most Africans have little or no money to pay the smugglers, and they are bond to clash with them. There was another shooting in the same area at the end of November. A week before the shooting a 14 years old lost a finger in a fight between Afghans and Africans. The biggest fight I remember in the big ‘jungle’ was between Afghans versus Sudanese, soon Africans versus everybody else, and involved pretty much everybody in the camp. Police selectively threw gas grenades at the Africans. Fights and very big fights, and divisions on the lines of race and ethnicity have always occurred in Calais. The worst year for fights was 2015, due to closure of the border, sudden arrival of thousands of people, and competition over points of passage. That is also the time smugglers became nastier and more violent. When free zones of passage were fenced up. When new gangs set up to control the few free points of passage left. When there were hardly any points of passage left, other than those controlled by increasingly violent smugglers. The closure of the borders strengthens the smugglers networks as people are increasingly depending on them to pass. It is all too easy to blame ‘the smugglers.’ The problem is the border, open the border and smugglers will disappear immediately. ‘Passeur’ is someone who helps others to pass, it does not define good or bad. Some smugglers I have known were real gentlemen, others are a horror. The tightening of the border seems to favour the emergence of worst type. The UK and French governments have created a bottleneck that gets worst every day, and many people get stuck in it. Including hundreds of unaccompanied minors, who are living in the woods, looked after by smugglers, some of whom are armed and crazy. with police and racists chasing them.